Proud Phuket is a luxury boutique hotel located at the peaceful and tranquil Naiyang on the northwestern coast of the island. 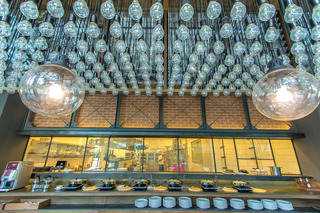 Its design is typical of traditional Phuket architecture but with an imaginative modern twist.Phuket's culture and nature are highlighted subtly throughout the hotel, from hints of the Gardenia flower through to the turtles known to hatch on our magnificent Andaman coast.Discover the true pride of Phuket and enjoy an authentic experience only to be found at Proud Phuket.At Proud Phuket Hotel, every effort is made to make guests feel comfortable. To do so, the hotel provides the best in services and amenities. To name a few of the hotel's facilities, there are free Wi-Fi in all rooms, 24-hour security, taxi service, daily housekeeping, 24-hour front desk.Hotel accommodations have been carefully appointed to the highest degree of comfort and convenience. In some of the rooms, guests can find complimentary tea, towels, slippers, complimentary instant coffee, sofa. The hotel offers an excellent variety of recreational facilities, including sauna, outdoor pool, spa, massage, kids club. Discover an engaging blend of professional service and a wide array of features at Proud Phuket Hotel. Surround yourself with nature and at this tranquil retreat in north Phuket and appreciate the real beauty of this paradise island away from the bustling tourist crowds. Situated on the fringes of Sirinat National Park there is an abundance of greenery and native wildlife in the area, and the beautiful beach with gently sloping white sand is just a few steps away.This family-friendly resort is located on the beachfront within a small village community only 8 minutes from the airport. There is a wide choice of charming accommodation spread out over the spacious grounds which are filled with scenic walkways, mature shady trees and delightful tropical gardens. There are three beautiful swimming pools complete with loungers and children's play areas in total pool, each offering a unique ambiance for guests to relax and enjoy. 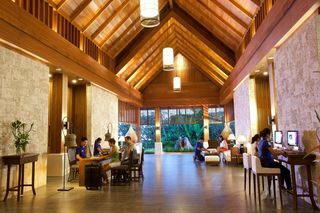 Thanyapura Health & Sports Resort is located fifteen minutes away from Phuket International Airport and presents a unique and inspiring destination for individuals, groups and families looking for a balanced approach to their lifestyle. Athletes of all levels train and prepare for global sporting events in the state-of-the-art facilities offered at Thanyapura whereas health conscious guests escape to rejuvenating health programs which edify the body and mind. FACILITIES:• 50-meter Olympic pool and 25-meter training pool• 6 plexi-cushion tennis courts (4 covered courts)• International standard artificial rugby pitch and ‘Soccer Pro' FIFA standard pitch• Rugby training material• Beach Volleyball Court• Beach Soccer Court• 500-meter cushioned athletics track (long jump, high jump, hurdles and start blocs)• 900-sqm. 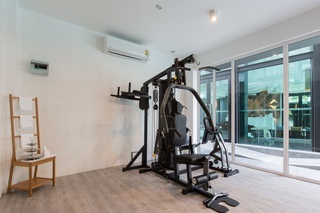 Fitness Centre • Studios for group activities (spinning room, functional movement room, fitness room)• Road Bike and Mountain Bike Rental• Locker Rooms with ice baths, steam rooms and saunas. The resort is dramatically located at Phuket's peaceful Nai Yang Beach, where the white sand borders the green pines of Sirinat Marine National Park. It also is situated just 15 minutes from Phuket International Airport.The resort combines the sophistication and style of Thai architecture and design. With the best facilities and services, all room types offer a comfortable private space. There are 47 accommodation units in total at this club resort, including villas. Guests are welcomed in the lobby with 24-hour reception and a hotel safe. Facilities include a restaurant, room and laundry services (both for a fee) and a car park.The resort features 47 rooms and villas, 15 of which have direct access to the swimming pool. All are en suite with a shower, bath and hairdryer. Standard in-room amenities include a double bed or king-size bed, direct dial telephone, satellite/cable TV, Internet access, a safe, minibar and a balcony or terrace. The air conditioning is individually regulated.The resort benefits from friendly and personalized service and enchanting facilities including a swimming pool, gym, library and Internet access. Parasols also offer shade on the hotel's sun terrace and there is a poolside snack bar. The nearby beach is sandy.The hotel serves breakfast each morning. The Touch Green is set on 25 rai of pristine, untouched natural land in the quiet and serene area of Naiyang on the northwest of Phuket Island and offers simple and comfortable living options for all travellers. 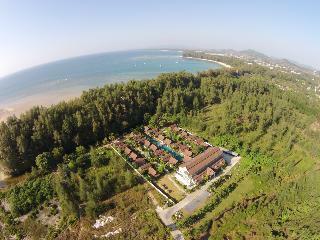 Phuket offers a variety of natural attractions; national parks, wildlife, magnificent rainforests and beautiful beaches. Whatever you prefer, a stay at The Touch Green is the optimal choice for a green and adventurous experience. You can visit untouched mangroves, hike through some of the largest areas of protected forest in Southeast Asia, and observe a range of species of birds. You can also enjoy kayaking and diving in the most dazzling places in the Andaman Sea. Ecotourism is growing in popularity and The Touch Green wants to play a role in the protection of our island's natural beauty. The Touch Green offers all the basic facilities, swimming pool, secure parking, and Wi-Fi. 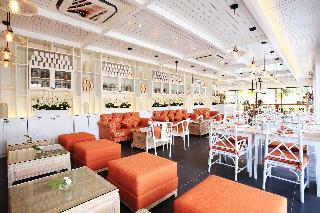 Featuring free WiFi, Baan Bua by TropicLook offers accommodations in Nai Harn Beach. Naiharn Lake is 0.7 miles from the property. Free private parking is available on site.The property is air conditioned and has a satellite flat-screen TV. Some units feature a terrace and/or patio with pool or garden views. There is also a dining area and a kitchen fitted with a microwave, a toaster, and a refrigerator. A stovetop and kettle are also available. There is a private bathroom with a bathtub in every unit. Bed linen are featured.Baan Bua by TropicLook also includes a year-round outdoor pool. The property also has grocery deliveries.Bike rental is available at the property and the area is popular for horseback riding. Guests can enjoy various activities in the area, including snorkeling and windsurfing. Phuket Airport is 22 miles away. Featuring air conditioning, Thaimond Residence by TropicLook offers accommodation in Nai Harn Beach. Naiharn Lake is 600 metres away. Free private parking is available on site.All units include a flat-screen TV. There is a seating and/or dining area in some units. There is also a kitchen, fitted with a microwave. A refrigerator and stovetop are also featured, as well as a kettle. Thaimond Residence by TropicLook features free WiFi . Towels and bed linen are offered.Thaimond Residence by TropicLook also includes an outdoor pool.The nearest airport is Phuket Airport, 36 km from Thaimond Residence by TropicLook. This 3 star hotel is located close to the airport of Phuket Island and was established in 2015. It is 12.0 Km from the Splash Jungle Water Park. 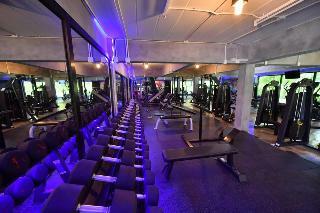 The Hotel has a bar, a coffee shop, an outdoor swimming pool and a fitness centre/gym. All 108 rooms are equipped with minibar, hairdryer, safe and air conditioning. loved everything from the friendly staff to the great value for money. great beach for a couple of quiet days and close to airport.